An evergreen Clematis originating from the Mediterranean. 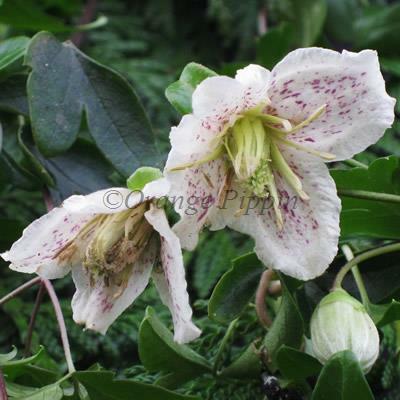 Clematis cirrhosa produces small, nodding-shaped flowers which are greenish- white or cream and are freckled reddish-brown inside during the late winter from December to February. Charles de Lescluse, writing in 1601, says that he first encountered Clematis cirrhosa in 1565 growing in Andalusia but it is not thought that he introduced it into cultivation then. Authorities differ as to whether it was introduced in 1590 or 1596. This wonderful climber with its delicately cut shiny green leaves will flower whether given some sun or a lot of sun and can be grown against a trellis, garden fence, wall, arches, pillars, pergolas or simply allowed to ramble away amongst the border with adequate support.